New Year's Resolutions, Sites of the Month and more! How Much Time Does The Average American Spend On Facebook? Happy New Year to you! January is the month for setting goals, and we hope this issue will inspire you to acquire new knowledge and try new experiences in 2013. First you'll find an alert about recent phishing scams that use the Amazon name.We urge you to stay vigilant about online security threats this year; keep your antivirus software updated and apply operating system and software updates as they're released. Looking for new resources for cooking, decorating, learning, and shopping? Take a peek at the featured Pinterest pins and sites of the month. And be sure to check out the fascinating facts about social media usage and the handy tips on generating a Gmail username. Be on the lookout for the latest phishing email that appears to be from Amazon.com but is not. Its message confirms the processed order of an HD TV or other item but shows that it is being shipped to an incorrect address. The phisher wants you to see the wrong address and click on one of the links in the email such as "Your Order" or "Merchant Contact Form" to get the problem corrected. Doing so could expose your computer to malicious viruses that capture passwords and private information. Or you could be tricked into entering your Amazon account number or login information. This is just one of many phishing scams that use the Amazon name. In general, keep in mind that Amazon will never send an unsolicited email that has an attachment or one that asks you to reply with personal information. If you shop at Amazon and need to verify an order, go to Amazon.com and check "Your Account." I will not respond to any email from anyone asking for my username and password no matter how important they make it sound. I will change the username and password for my wireless router to something different than the defaults it came with to keep the guy parked out in the street off my Internet connection. I will not use the same username and password for every Internet account I have. I will create strong passwords and change them regularly. I will keep my antivirus software updated and keep current with critical Windows Updates through my computer's automatic updates or by visiting update.microsoft.com. 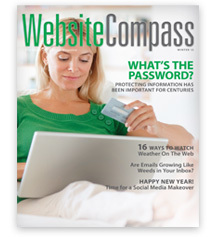 For more valuable Internet ideas, reminders, tips, trends, troubleshooting and terms, 3 Rivers' Website Compass online magazine is an invaluable resource for virtually anything you do online, both at home and at work. Check out the article below for more information. Back issues are available. Feature Article: What's the Password? Email Basics: Are Emails Growing Like Weeds in Your Inbox? We hope you find Website Compass to be a welcome resource. In addition to the printed magazine, you can also access it online by clicking on this link. This Month's FAQ – How Much Time Does The Average American Spend On Facebook? Question: I'm curious how my use of social media compares with others. For example, how much time does the average American spend on Facebook per month? Answer: Let's start with the big picture. According to research posted in Morrison Foerster's Socially Aware blog, use of social media has more than doubled in the last several years. While only 24 percent of all online Americans had at least one social-media profile in 2008, 56 percent of them do now. To answer your question, the average Facebook user in America spends almost seven hours per month on the site. That's well ahead of Tumblr and Pinterest, which tie for second place with 1.5 hours per month. By contrast, the average American visitor to Twitter, LinkedIn, and Google+ spends less than half an hour on these sites per month. www.mrlincolnswhitehouse.org – If Steven Spielberg's new movie Lincoln has sparked your interest in the 16th President, check out this site from the Lincoln Institute. It features fascinating details about Lincoln's years in the White House as well as photos and sketches. www.everydayhealth.com – Are you resolving to adopt healthier habits in 2013? You'll find plenty of resources at this site including information on common health conditions and topics, a symptom checker, tips on food and fitness, HealthTalk Live Chats, and educational videos. www.coursera.org – Here's an opportunity to pick up invaluable knowledge without paying tuition. Instructors from Princeton, Duke, Caltech, and 13 other schools conduct free online classes on everything from math to music, complete with video lectures, quizzes, and homework. www.shopittome.com – Shopping for clothes just got easier. Simply tell this site what size you wear for various garments and select your preferred designers and brands. You'll get regular emails with a custom-tailored list of fashion bargains that will save you 40-70 percent. You probably think of online passwords as serious security precautions. But have you ever thought of them as funny? You will after watching Don Friesen's comedy routine about trying to create and remember passwords. Cute! Cute! Take a minute to enjoy this video of adorable twin babies sitting side by side in high chairs. When their father starts playing the guitar, the girls immediately "dance" to the music while grinning and giggling at each other. The username or a very similar variation is already in use. The username was in use but the address has been deleted. The username was reserved to prevent spam or abuse. Think beyond "first name dot last name." If you have a common name, try using your initials, middle name, or a nickname. Some people even use creative amalgamations of their names. For example, Brandon Anderson becomes Branderson@gmail.com. Incorporate your personality or profession. Come up with a list of adjectives that describe you and find a way to incorporate one or two of them into your username. You may also want to consider making reference to your profession with a user name such as educator.edward@gmail.com. Whatever you do, don't make your username complicated or hard to remember. Using a generic name with a number makes you look generic (and a bit like a spammer). So please don't use usernames along the lines of bobsmith15@gmail.com. Check to see if it's available everywhere. Whatever username you choose for Gmail, it would be great to keep it consistent through the various social media channels. Before you make that final naming decision, you may want to enter the name at www.knowem.com to see if you can claim it on all the sites you use. Another option for getting the Gmail username you want is to register your own domain and use Google Apps instead. Google Apps for Domains offers all the functionality of a standard Google account (Gmail, Calendar, Drive, Google+, etc. ), but it's mapped to a custom website. It costs about $10 to register your own domain and then set up Gmail as your email client. This way, you can get a cool email address like Jane@JaneDoe.com. Remember, your username is a big part of your identity on the Web. Take the time to choose it carefully.